Somewhere in a remote corner of Colorado, frigid rivers twist and plunge through granite canyons, eventually spilling over towering falls as they roar through forests of supple pine and spruce. Here, mountain peaks create a backdrop of some of the most awe inspiring mountain scenery on the continent, soaring into azure skies at elevations greater than 14,000 feet. This “somewhere” is Rocky Mountain National Park. 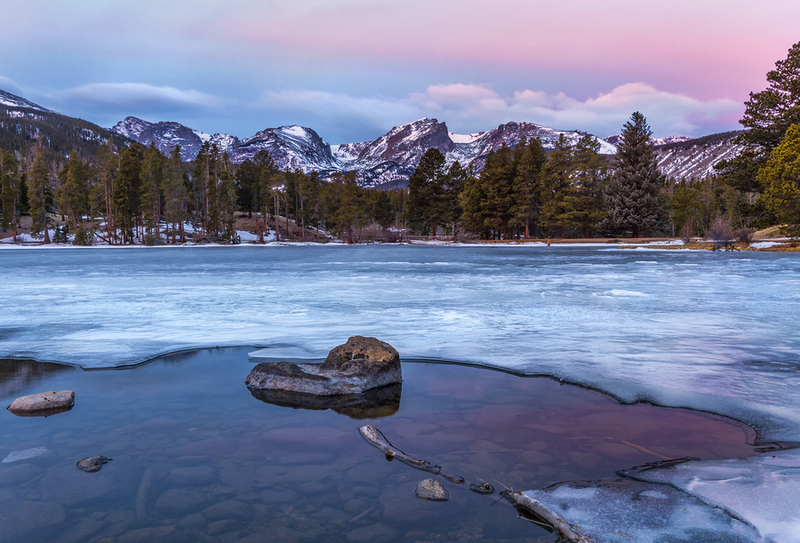 While the area in and around Rocky Mountain National Park is beautiful year round, autumn in the Park is uniquely alluring as winter’s conviction stirs a desperation amongst animals and vegetation alike. The Park is home to wildlife such a bear, cougar, bighorn sheep, moose and elk (among many others), who tend to be more active during the fall months as they are on the prowl, beginning preparations for what’s in store. Elk, or ‘wapiti’ as they are known to Native Americans, make their presence known during the autumnal rutting season. As many as 3,200 elk are scattered throughout the park during the summer and fall months, with 600-800 enduring the Park’s winter. Herds congregate by the hundreds into the valley to mate during autumn, and it is this time when the elk’s famous bugling can be heard. A bull elk’s bugle is a surreal song; described as a combination of grunts, screeching trumpets, and high-pitched shrieks and shouts. These bugles communicate to cow elk in the area, and also alert other bull elk that the bugling bull is ready to defend his cows. Rutting season is fantastic for photographers looking to capture Elk, so we’ll certainly do so while making sure to keep our distance, as this is also perhaps the worst time to have an elk’s agitation be directed towards you and your camera! Winter preparations aren’t limited to just animals. Aspen turn their colors from green to gold, and then finally a brilliant red. These high alpine trees with unmistakable white trunks add amazing depth and contrast to photographs with their glorious colors. The whole region’s landscape is awash in natural beauty, and by joining Backcountry Journeys, you’ll be there at just the right time to soak it all up. It is because of this aesthetically dynamic environment that Backcountry Journeys schedules the inn-based Autumn In Colorado: Rocky Mountain National Park tour at this time, when a simple change in season creates unmatched photographic opportunity to sew foregrounds and middle-grounds of animals, trees and lakes to the backgrounds of this majestic mountainous landscape, into spectacular images. While massive glaciers shaped the meadows and peaks, the area that is now Rocky Mountain National Park was, and is, an inhospitable land. It’s human history dates back some 11,000 years when tribal communities began venturing into the valleys and mountains. Spearheads broken in the fury of a mammoth’s charge and scrapers discarded along a nomad’s trail speak little to the area’s early native peoples. Even though it was never their year-round home, the Ute tribe favored the areas green valleys, tundra meadows, and crystal lakes. The Tribe dominated the area until the late 1700s. The Pikes Peak gold rush of 1859 drew hopeful miners and speculators. Their settlements at places like Lulu City, in what is now the northwest part of the park, were ephemeral. The rousing boom times yielded to an industrious homesteading period starting in the 1860s. The same harsh winters that spark the autumnal activity of plants and animals proved inhospitable to grazing, but the abundant bears, deer, wolves, and elk howled through the trees and the mountains continued to draw Easterners impressed by the landscape. And as ranchers, miners and homesteaders began to brave the winters and settle in the region, so came tourists. By 1900, the growing national conservation and preservation movement led by Theodore Roosevelt, Gifford Pinchot, and John Muir, advocated an appreciation for nature. In 1909, naturalist Enos Mills, known later as the “John Muir of the Rockies,” championed the area to become protected. In 1915, Mills work was rewarded when then President Woodrow Wilson confirmed Rocky Mountain as the Nation’s tenth National Park. On our tour, we’ll visit and make photographs at locations such as Moraine Park, a jaw-dropping sight to behold as massive granite peaks soar above lush alpine meadows creating a sublime mountain scene. We’ll also travel the famous Trail Ridge Road, which rising to elevations over 12,000 feet, has the distinction of being the highest paved road in North America. Constructed in 1932, the road spans 48 miles of natural landscapes from the Park’s eastern border all the way to Grand Lake, Colorado to the west. An experience in itself, the “highway to the sky” climbs some 4,000 feet in a matter of minutes and offers some of the Park’s most spectacular sightseeing. 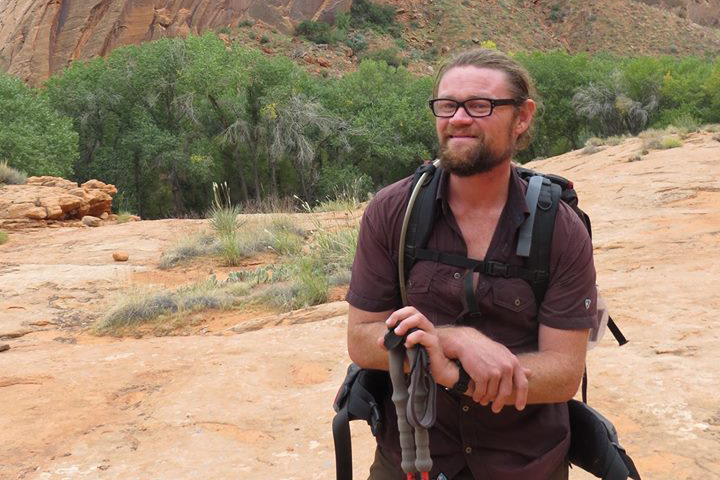 We’ll be certain to stop for photographs and viewpoints along the way where we’ll see vistas galore and vast meadows. Bighorn sheep, elk, and other wildlife are often spotted from this road. 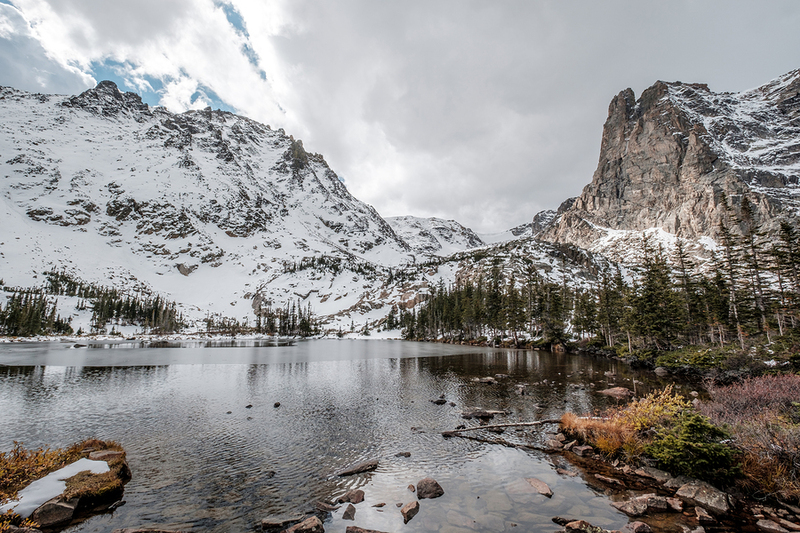 Much like Trail Ridge Road, no trip to Rocky Mountain National Park would be even close to complete without visiting the extremely popular Bear Lake. So, we’ll get there before all those “tourists” are out of bed, and look for images of amazing reflections, and often smooth water, around the morning’s first light. An acceptable reason to wake up at pre-dawn from our comfy Estes Park lodging. After we finish with Bear Lake we’ll hike to one of three other nearby lakes: Emerald Lake, Nymph Lake or Dream Lake depending on the lighting conditions. All of these lakes often act as stunning alpine mirrors reflecting on glassy water the dramatic mountains surrounding them. After exploring and shooting the lakes and mountains we’ll backtrack to Alberta Falls, which is an incredible high mountain waterfall with a fantastic backdrop of high summits. We’ll spend some time shooting the falls and learning how to control the midday light with neutral density filters to create stunning slow shutter speed waterfall effects. All the fun isn’t reserved for daytime hours, though. 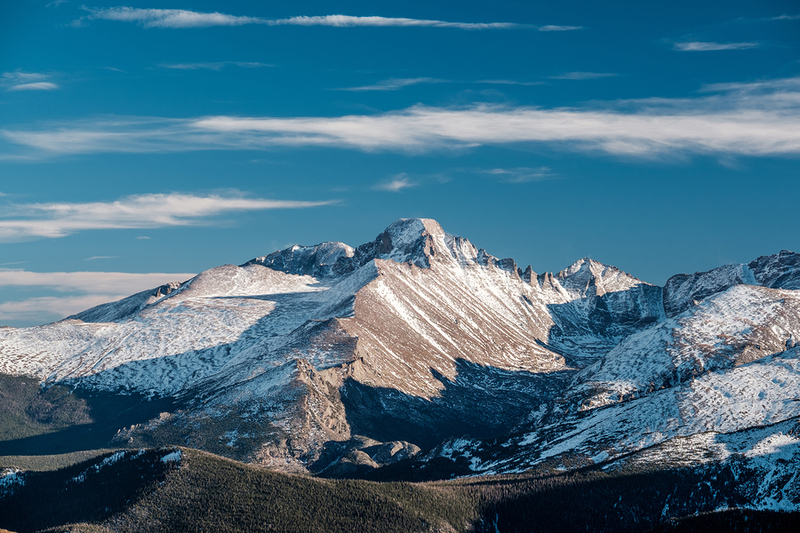 Longs Peak is the Park’s tallest, and most famous peak, rising to 14,259 feet. 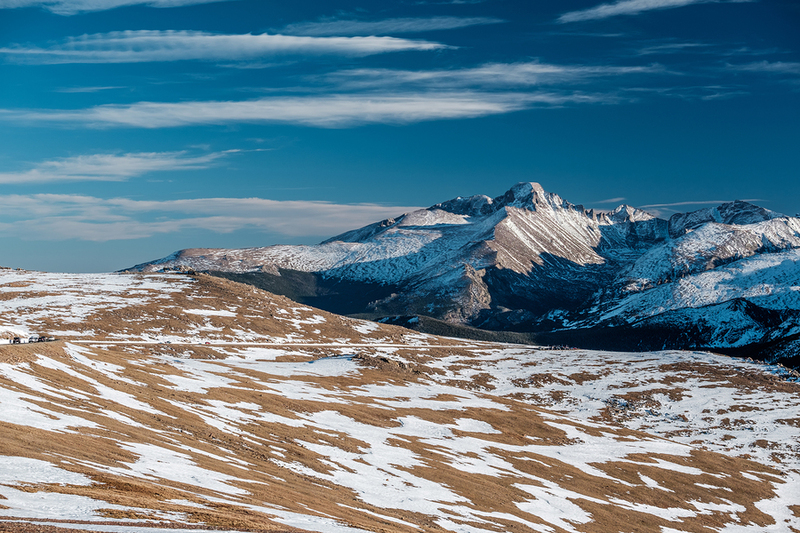 Named after Major Stephen Long, who is said to be the first to spot the great mountains on behalf of the U.S. Government in June of 1820, the peak is one of the most prominent mountains in Colorado, rising 9,000 feet above the western edge of the Great Plains. Together with nearby Mount Meeker, with an elevation of 13,911 feet, the two are sometimes referred to as the Twin Peaks. We’ll be looking for images well after sundown, working to capture the majestic Longs Peak alongside the Milky Way. After a cozy night at our lodge in the village of Grand Lake, we’ll hike the Cache La Poudre River Valley, again first thing in the morning. This is a fabulous journey with ample photographic opportunities along the bottom of a picturesque mountain river valley. We’ll photograph breaktaking meadows and wildflowers along this six mile route, which is a fantastic opportunity to photograph wildlife away from roads. On our last day we’ll spend the morning with the Colorado River headwaters in an idyllic meadow setting, with the high peaks of the Continental Divide framing the backdrop. Imagine this: these waters eventually make their way to Arizona where they have carved away at Grand Canyon for 6 million years! These will be our final moments together amongst the mountains, meadows, and scenery of Rocky Mountain National Park. Some of which being the most glorious we’ve ever seen.